As always when searching for used auto parts, prices & availability we encourage you to call our parts experts so they can quickly guide you to not only the best prices on parts, but also the correct parts to get your vehicle back on the road. Their professional advice may help you save money & time. If you are searching for parts prices after our normal business hours or prefer for us to contact you, use our Parts Price Request Form and one of our sales representatives will contact you promptly. Either way you will get great prices on used parts with Matlock's. Matlock's is a full service used auto parts and auto recycling company serving NC, SC, VA and the entire US via nationwide shipping including: Hickory, Charlotte, Greensboro, Statesville, Winston Salem, Asheboro, Asheville, Cleveland, Claremont, Taylorsville, Salisbury, Mooresville, Kanapolis, Concord, China Grove, Lincolnton, Gastonia, Huntersville, Cornelius, Denver, Lexington, Mocksville, North Wilkesboro, Clemmons, High Point, Mt. Airy, Elkin, Yadkinville, Siler City, Cherryville, Morganton in NC, Martinsville, Danville in VA. We stock thousands of used parts for most makes, models both foreign and domestic including: Engines, Transmissions, Axles, Rear Ends, Starters, Alternators, A/C Compressors, Radiators, A/C Condensers, Cooling Fans, Transfer Cases, Wheels, Tires, Auto Body Parts including: Front Ends, Hoods, Fenders, Grilles, Front Bumpers, Headlights, Fog Lamps, Turn Lights, Doors, Body Panels, Taillights, Rear Bumpers, Deck Lids, Quarter Panels, Interior Parts and almost any used part on a salvage vehicle. We also buy local wrecked, salvage & junk cars for recycling. 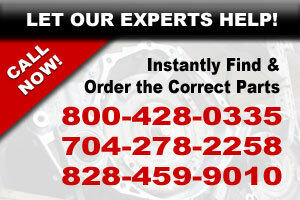 Find the best prices on local used auto parts in NC.